Three times in the last two seasons, Port Allegany and Cameron County have met on the football field with either a division title or a playoff berth at stake. Three times, the Red Raiders needed a fourth-quarter touchdown to eke out a close win. On a cold, clear Friday night in Emporium, four quarters wasn’t long enough to decide the game, but the ending was all too heartbreakingly familiar. Following a fourth-and-goal fumble to stop the Gators’ first possession in overtime, Jason Blose scored the game-winning touchdown – his third of the night – to give Cameron County a 27-21 victory and its fourth consecutive AML North championship. “We had him stopped at the 10-yard line, but we didn’t make the wrap, didn’t make the tackle when we had to. At least two or three kids bounced off him, and that was that,” Port coach Mike Bodamer said quietly as the stands emptied. Early on, it didn’t look like overtime was going to be an option, as the Red Raiders used a steady dose of Blose, who finished the game with 30 carries for 174 yards, and 240-pound fullback Andrew Fragale to pound their way to a 14-0 lead on their first two drives. “We know we’re weak up front; we get pushed around,” Bodamer said. “We try to come up with the best defense we can to try to stop the run, but we just get ‘out-physicaled.’ That Cameron County line is a big, strong, physical team. We have a little bit of size, but our kids just aren’t as strong as they are. After going nowhere the first two times they had the ball, the Gators finally found an answer on their third drive. Under heavy pressure from the blitzing Red Raiders, quarterback Matt Bodamer spotted Seth Lowery open in the right flat; the senior running back did the rest, picking his way through the defense for a 49-yard touchdown. Ken Kysor’s extra point was blocked, but Port was on the board. An inspired defense sent Cameron County three-and-out on its next series, and after linebacker Brock Taylor recovered a fumbled snap to end the following one, the offense was back in business at the Raiders’ 44. With just 0:14 left in the half, Bodamer rifled a pass over the middle to Tyce Miller for a 17-yard touchdown, and bootlegged in the tying two-point conversion. As they did in last year’s playoff game, Morelli’s team came out of the locker room and marched down the field to regain the lead. This time, though, it was the passing game doing the damage, as quarterback Zack Austin completed all three of his attempts on the drive and a 36-yard halfback option from Blose to Vince Summers set up Blose’s 1-yard score. Port appeared to have a quick answer when Bodamer followed Trey Miller’s long kickoff return with a 52-yard touchdown pass to Camrin Stuckey. But a holding penalty negated the score, and an interception ended the drive two plays later. As the fourth quarter began, down by a touchdown and facing a 4th-and-3 deep in their own territory, the Gators gambled and won. Dropping back to punt, Stuckey instead took off for the chains and dove just past the first-down marker to keep the drive alive. Two plays later, Charlie Buchanan caught a Bodamer pass over the middle, broke a tackle, and almost scored, taking the ball 49 yards to the CC 4 before Austin finally managed to drag him down. Bodamer finished the drive with a 1-yard keeper, and Kysor booted the critical extra point to make it 21-all with 7:56 remaining. Neither offense could mount a serious challenge after that, trading punts before Bodamer ended regulation by picking off Austin’s pass as time expired. The Gators got the ball first in overtime, and a tough Lowery run on first down moved it to the 3. Thinking they were closer, coach Bodamer called quarterback sneaks on the next two plays, but the stout Red Raider defense managed to keep Matt Bodamer out of the end zone. Then, with fourth-and-goal at the 1, the unthinkable happened as the ball popped loose behind the line of scrimmage, ending Port’s scoring chance and setting the stage for Blose’s game-winning run. “I told the kids, I take responsibility for that last play,” Bodamer said. “You can’t run the same play three times in a row. They were getting excited to get to the one-inch line, tried to go on a silent snap, and … I saw that ball fly out of there and thought, oh, God, no. Now, with one regular-season game remaining, the math is simple for the 4-4 Gators: beat Coudersport – for the first time since 2003 – in Saturday afternoon’s home finale (1:30 p.m., WHKS) to clinch a District 9 playoff berth, or pack up the helmets and shoulder pads for the winter. The 10th-seeded Port Allegany boys soccer team gave Brookville all they wanted in Monday’s District 9 playoff game, forcing overtime before a direct kick from just outside the box gave the seventh-seeded Raiders the 3-2 win and a date at No. 2 Karns City later in the week. “Overall, it was a back-and-forth game,” said Gators coach Aaron Clark. Brookville scored early, but Max Morris netted the equalizer on an assist from Ken Kysor, and Sam Shaffer put Port up 2-1 with help from Ben Osani and Scott Brookens before heavy Raider pressure led to the game-tying goal to send it to the extra session. Sophomore Ben Edgell made six saves for the Gators, who conclude their season with an 8-9-2 record. While obviously disappointed with the outcome, Clark was pleased with his squad’s effort against the larger school, which competes in Class AA in most sports. “If you’re not going to win, it’s nice to put a scare into the other team,” he chuckled. And with Edgell and several other underclassmen gaining critical playoff experience – “it’s a different atmosphere, different intensity,” Clark noted – he’s looking toward the future. “Even with some players leaving, I feel confident with some of the young players we have coming back,” he concluded. With the District 9 volleyball playoffs a week away, Port Allegany ran into two teams looking to do some postseason damage, dropping a four-set match (25-22, 25-15, 19-25, 26-24) on defending North Tier League champ Otto-Eldred’s home court before pushing Coudersport to five sets on Senior Night at the Gator gym. “The team came right out and played good power volleyball. We just couldn’t hang onto the edge,” coach Sharon Daniels said after the loss to the Terrors on “Dig Pink” night. Rachel Taylor (18 kills, 10 blocks), Renee Edgell (16 kills, 12 digs, 2 blocks), and Becca Culver (7 kills, 5 blocks) did most of the heavy hitting for the Port squad, with Jenny Shelley (23 assists) and Kyley Mickle (13 assists) setting them up and Becky Andrus (29 digs) leading the defense. The Gators battled Coudy to the end on Tuesday, but the Falcons eked out a fifth-set win to take the match 25-19, 25-27, 25-21, 14-25, 15-12. Andrus was all over the court on defense, finishing the match with 62 digs in addition to serving for 10 points. Taylor (19 kills, 5 blocks, 11 service points) and Edgell (12 kills, 1 block and 16 digs) again led the Port attack on passes from Mickle (22 assists, 6 kills, 3 blocks) and Shelley (21 assists, 7 kills, 10 digs). Now 7-7 overall and 6-7 in league, Port travels to Northern Potter on Thursday for the regular-season finale. The stunning view from the new pressbox in Sheffield. The Gators didn't take much time to stop and enjoy the scenery, though, rolling up 41 first-half points on the way to a 50-6 victory. Once the Port Allegany Gators made the trek up “Wolverine Mountain,” it was all downhill for Sheffield. An opportunistic Port defense made life miserable for their hosts in Saturday’s Allegheny Mountain League game, picking off four passes and keeping the overmatched Wolverines bottled up in their own end of the field for most of the afternoon, and the offense cashed in on six of seven first-half drives as the Gators romped to a 50-6 victory. Four of those touchdowns came via the arm of Matt Bodamer, who started the scoring onslaught with a 10-yard bootleg on Port’s first possession and also snared one of their interceptions on defense. The sophomore quarterback completed 7-of-8 passes for 213 yards, in the process reaching the 1,000-yard milestone for the second consecutive season. The Wolverines’ woes started on their first drive, when their punter’s knee touched the turf as he attempted to field a one-hop snap. The resulting turnover on downs handed the Gators the ball at the Sheffield 18, and it didn’t take them long to capitalize on the mistake. Two Seth Lowery runs set up third-and-short, and with the Sheffield defense crowding the line of scrimmage expecting another foray up the middle, Bodamer took the snap, rolled to his right, and headed for the end zone. Ken Kysor, who made it to the game just in time to complete a doubleheader after playing in the soccer team’s Senior Day win over Johnsonburg, added the extra point and the Gators were on the board. Port’s quick-strike offense moved even faster the next few times they touched the ball, with Bodamer following Wolverine punts with touchdown passes of 66 yards to Tyce Miller and 35 to Charlie Buchanan. The other Miller twin got into the act at that point, as Trey picked off Wolverine quarterback Ike Nearing’s pass at the Sheffield 47 and returned it all the way to the 14. Lowery capped that short drive by rumbling into the endzone from 11 yards out, and at the end of the first quarter, the Gators’ offensive stats looked like something out of a video game: Despite running just eight plays and holding the ball for a mere 2:20 out of the first 12 minutes, they led 27-0 before the Wolverines ever ventured across their own 40-yard line. Sheffield eventually put a drive together, with Hunter Smith ending the shutout on a 3-yard run midway through the second quarter. But the Gators didn’t blink, responding with Bodamer’s 60-yard strike to Buchanan. That pair also combined to stop the next two Wolverine possessions via interception, and Camrin Stuckey’s 9-yard touchdown catch made it 41-6 at the break. With the running-clock rule in effect for the second half, Tyce Miller took the opening kickoff down the sideline until he was finally dragged down by the jersey at the Sheffield 38. A lost fumble thwarted the drive at the Wolverines’ 1, but the defense made up for it a play later when Zach Ramadhan and Johnny Sena stuffed Smith in the end zone for a safety. The loss was one of 15 negative-yardage plays by a Sheffield offense missing several starters, including standout running back Kalil Slaughter. From that point, the Gators worked on their ground game before sending in the second unit. Backup quarterback Garrett Drabert notched the game’s final score on a 12-yard bootleg, with a busy Kysor adding his sixth extra point in seven attempts on the day. Port moved to 4-3 with the win, tying Coudersport for second place in the AML North a game behind Cameron County, which has won five in a row after dropping its first two games of the season. The Gators head to Emporium Friday night knowing they’re the last team standing between the Red Raiders and a fourth consecutive division title, and that any loss would deal a severe blow to their own playoff hopes. Blose, who was moved from quarterback to tailback this season by new head coach Mark Morelli – the all-time wins leader at Ridgway before hiring on as Cameron County’s defensive coordinator last year – leads the team with 107 carries for 747 yards and six touchdowns. Fragale (62-382, six touchdowns) and quarterback Zack Austin (40-333, five touchdowns) will also see their share of carries in Morelli’s run-heavy scheme. Austin has completed 26 of 69 passes for 399 yards, four touchdowns and four interceptions. “It’s definitely a game we can win. No reason why we can’t,” Bodamer said. “I told the kids, ‘Last year they were 9-0, and conceivably, we could have beaten them twice.’ It was that close. But they’ll definitely be ready for us, and going over there is always a tough place to play – although actually, we seem to play better over there than we play at home against them for some reason. “These kids know what has to be done: if we lose our chances are gone, if we keep winning we keep going. We’ll get a good week of practice in … and try to feed them potatoes and steak all week and put some weight on them so (Cameron County) won’t push us around,” he added with a chuckle. The Port Allegany volleyball team picked up a pair of victories last week, beating Cameron County for the second time before setting down Smethport to run its winning streak to four matches before Tuesday night’s straight-set loss to unbeaten Oswayo Valley. Jenny Shelley led the way in the Lady Gators’ 25-18, 25-11, 16-25, 25-11 win at Emporium, filling up the stat sheet with 15 service points, 11 kills, 15 assists, and 8 digs. Kyley Mickle (3 kills, 16 assists), Renee Edgell (5 service points, 6 kills, 11 digs), Rachel Taylor (5 service points, 15 kills, 3 blocks), Becky Andrus (12 service points, 3 kills, 38 digs) and Nikki Andrus (14 service points, 2 kills, 7 digs) also contributed to the win over the Red Raiders. Shelley (12 assists, 5 kills, 16 digs), Mickle (7 assists, 4 kills, 11 digs), Andrus (34 digs), and Kris-Ann Raymo (2 kills, 12 digs) also contributing to the cause. Thursday’s match at Otto-Eldred will have a different look; instead of Gator orange and black or Terror blue and gold, both teams and many of the spectators will be wearing pink. Nationwide, more than 1,000 college and high school volleyball teams are scheduled to participate in Dig Pink® events this year as part of the Side-Out Foundation’s campaign of furthering breast cancer awareness, education and patient services. The O-E Music Boosters are sponsoring a Soup’s On dinner beginning at 5 p.m. in the high school cafeteria; the junior varsity match is slated for a 6 p.m. start, with the varsity to follow. The regular season concludes next week with Tuesday’s match against visiting Coudersport – when Nikki Andrus, Renee Edgell, Kyley Mickle, and Ashley Bernardi will be honored on Senior Night – and a trip to Northern Potter on Thursday, Oct. 28. As the clock ticks toward November, the Port Allegany boys soccer team is fine-tuning its game for the District 9 playoffs. With Wednesday’s trip to Brockway the only regular-season contest remaining, the Gators’ win streak stands at four games after sandwiching road wins at Archbishop Walsh and DuBois Central around Saturday morning’s Senior Day shutout over Johnsonburg. “We’re building up the style of play that we want and doing things the way we’ve been wanting to do it all season long,” coach Aaron Clark said. Tyler Kittilson led the scoring barrage in Olean on Thursday, netting three goals in a 7-1 win over the Eagles. Sam Shaffer celebrated his final home game by matching the feat against the Rams, with fellow senior Tyler Smith making four saves to pick up the win. Ben Edgell was back in net against DuBois, stopping four shots to record his second shutout win in the last week, while Scott Brookens scored both goals for the Gators on assists from Ben Osani, Sam Kysor, and Ken Kysor. The DuBois victory assured Port High (8-7-2) of finishing at least .500, with playoff seeding announced next week. This season has been a challenging one for the Port Allegany girls soccer program, with youth and inexperience contributing to several close losses as the team struggled with learning how to win. On Friday afternoon, those learning experiences finally paid off as Fernanda Spallanzani scored the game’s only goal to boost the Lady Gators to their first victory of the season, a 1-0 final over DuBois Central Catholic. “It was about heart. They were motivated,” coach Travis Cowburn said. Spallanzani, an exchange student from Argentina, also netted Port’s lone goal in Saturday morning’s 6-1 loss at Genesee Valley. “She was a blessing, to come in here and liven things up a little bit,” Cowburn said. The physical matchup against the New York team, part of a four-games-in-five-days stretch, helped wear down the Gator squad in the season’s final two games, a 6-1 loss in Monday’s rematch at DCC and a 4-0 shutout by Elk Catholic the following night. Port finishes the season with a 1-14 record and a “wait until next year” attitude. The Gators will lose five seniors from this year’s team, including returning UAVSL All-Star Bryanna Evens, but goalkeeper Jordan Edgell leads a large group of returning starters which should be bolstered by some promising freshman talent. As he has been for most of the season, Jacob Stehle was the first Gator runner to cross the finish line at Tuesday’s North Tier League meet at Oswayo Valley, finishing the 5-kilometer course in 19:57.27 to place 16th out of 40 runners. Northern Potter’s Steven Kibbe won the event with a time of 17:27.17, but OV runners Spencer Cole, Trevor Howard, and Barrett Kemp finished 2-3-4 to claim the NTL title. Jameson Haskins (22:06.90, 26th place), Dallas Taylor (23:05.06, 29th), Jacob Undercofler (23:11.36, 31st), Logan Hutton (23:44.64, 32nd), Lucas Manning (25:13.22, 36th), and Bryan Pritt (25.17.23, 37th) also completed the varsity race for Port. The lone Gator girl, Jackie Lewis, finished 20th in 24:56.59. Adam Koehler won the junior high race in 11:06.30. The season will conclude for most area runners at the District 9 Championships, slated for Oct. 30 in Ridgway. Smethport may have dominated the 1990s in its long and storied gridiron rivalry against Port Allegany, but the tide turned soon after the calendar flipped to 2000. Last Saturday, on a gorgeous fall afternoon at Gator Field, Port continued its recent success in the series. Using a balanced offense and some sturdy defense, the Gators held on for a 20-12 victory – their ninth in a row against the Hubbers – to even their record at 3-3 and stay a game behind North leader Cameron County in the division race. Senior Seth Lowery had the Hubs on the run early, rumbling down the Gator sideline for a 56-yard touchdown on the second play from scrimmage. Ken Kysor’s extra point was good, and just :54 into the game, Port had a 7-0 lead. Linebacker Trent Neal, one of the sophomores coach Bodamer was talking about, stuffed Smethport running back Ryan Wells on fourth-and-short on the Hubs’ first drive, and the Gators were right back in business at the visitors’ 33. The drive stalled inside the 10, but Kysor’s 23-yard field goal made it 10-0 midway through the first quarter. The Hubber offense found its stride on the next possession, driving 80 yards in nine plays to Wells’ one-yard touchdown run, but the Gators broke through to block the extra point, leaving the score 10-6 as the first quarter ended. Another short Kysor three-pointer extended the Port lead, and Matt Bodamer’s 3-yard bootleg gave Port a two-touchdown lead just before the half. The sophmore quarterback completed four of six passing attempts on the drive (and 13 of 26 overall), including a critical third-down conversion fellow soph Tyce Miller snared with his fingertips. “He dropped that first one and I wasn’t too pleased with him, but he came back and had a couple of nice catches,” coach Bodamer said of his young wideout, who led all receivers with four catches for 69 yards. The second half was marked by stellar defensive plays and a shower of penalty flags – there were 20 in all assesed between the two teams – which left both coaches muttering about mental mistakes. 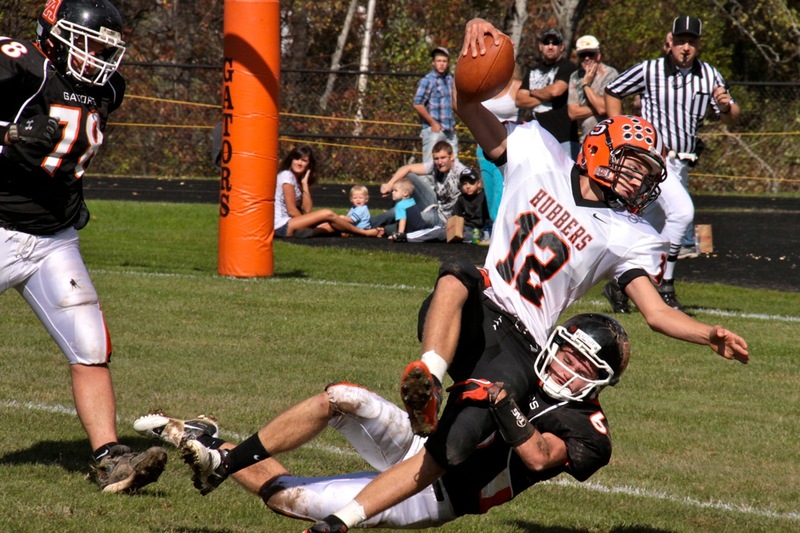 “That’s something we’ve been working on,” Smethport coach Jesse Cheatle admitted. “Seems like the last couple of games, every time we get something good going on, we shoot ourselves in the foot. You can’t do that against Port Allegany, or Cameron, or any other team. Over on the other sideline, Bodamer felt the same way. Those mistakes wiped out a 65-yard punt-return touchdown by Camrin Stuckey, and also affected Kysor’s deflected field goal attempt. Smethport got back within one score on Kevin Lord’s 9-yard touchdown pass to Andrew Paulickwith 2:05 left on the clock, but Neal alertly fell on the ensuing onside-kick attempt to seal the Gator win. But while the Port mentor was relieved to come away with the victory, he knows there are challenges ahead if the Gators want to make a return trip to the playoffs. “We still have Cameron County and Coudy. We can’t lose or else we’re out of it. Our kids are taking it one step at a time; today was sloppy, but I’ll take a win any time and we’ll be happy with it,” he said. The next step is a trip to Sheffield on Saturday (1:30 p.m., WHKS) to face the Wolverines, who dropped a 10-8 decision at Otto-Eldred last Friday night to fall to 1-5. Standout running back Jimmy Hahn and 1,000-yard passer Craig Fitch graduated from last year’s team, but junior Kalil Slaughter, the defending District 9 champ in the 100-meter dash, has plenty of big-play potential. 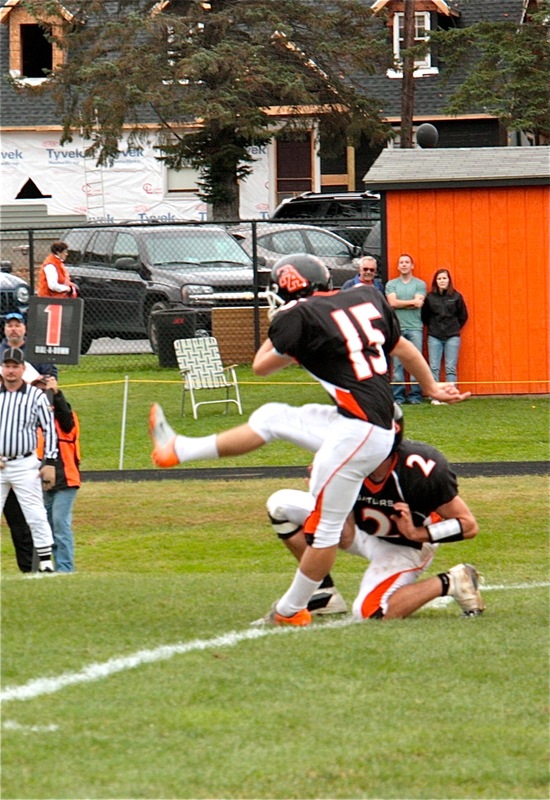 Senior kicker Ken Kysor (15) booted a 40-yard field goal and added five extra points in Port Allegany's 44-6 Homecoming win over Otto-Eldred Saturday afternoon at Gator Field. Heading into Allegheny Mountain League division play, Port Allegany knew they’d need to go on a winning streak to have any chance at a District 9 playoff berth. 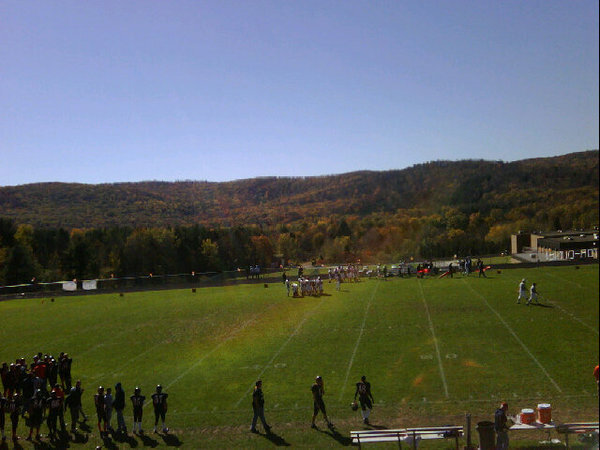 So far so good, as the Gators celebrated Homecoming on Saturday afternoon by routing winless Otto-Eldred 44-6 to remain a game behind North Division co-leaders Coudersport and Cameron County. Sophomore quarterback Matt Bodamer did most of the early damage with his arm, hooking up with Camrin Stuckey for the senior wideout’s team-leading sixth and seventh touchdown catches of the season to give the Gators a 14-0 lead, the second on a perfect fade to the left corner of the end zone. Port’s next drive stalled at the Terror 23, but that was close enough for the team’s newest weapon, Ken Kysor, who jogged on to attempt a 40-yard field goal. The senior’s kick sailed through with a few feet to spare, leaving longtime observers of the program wondering if they’d just seen a new school record, and a pumped-up Kysor drilled the ensuing kickoff through the end zone for one of his three touchbacks on the day. Following an interception by Charlie Buchanan, the Gator passing game struck again later in the second quarter. Facing third-and-long at their own 24, Bodamer dropped back and looked deep for Buchanan, who hauled in the pass at the O-E 30, cut back toward the middle of the field, and sprinted to the end zone for a 76-yard touchdown catch. Seconds later, Zach Ramadhan tacked on a 1-yard score on a short drive set up by a Stuckey pick, Kysor was perfect on his fourth extra point, and the scoreboard read 31-0 as the Homecoming court took the field for the halftime ceremony. Bodamer displayed some fancy footwork of his own the first two times he touched the ball in the third quarter, weaving his way through would-be tacklers for a 55-yard interception-return touchdown, then outrunning the Terror defense for a 65-yard score on the Gators’ first second-half play from scrimmage. The second-team offense took over at that point, with senior running back Seth Lowery staying on the field just long enough to notch his third 100-yard game of the season, finishing with 102 yards on 12 attempts. O-E workhorse Luke Kerr broke the shutout on a 13-yard run midway through the fourth quarter, but by then, most of the talk in the stands had turned to next week’s renewal of the ancient rivalry with Smethport, who led Cameron County before dropping a 7-6 heartbreaker on Friday night. That game is slated for a 1:30 p.m. kickoff Saturday at Gator Field. “They’re big and physical,” Bodamer said of the 1-4 Hubbers. “We’re going to have to stop their run game; they’ve got some big boys up front. It’s going to be a dogfight. OE – Nate Bair 4-12, 39 yards, 2 INT; Luke Kerr 0-1, 1 INT. PA – Matt Bodamer 8-15, 214 yards, 3 TD, 1 INT; Garrett Drabert 2-3, 11 yards. OE – Kerr 31-148, 1 TD; Bair 12-21; Clay Pinner 2-8; Jake Knapp 1-(-4). PA – Seth Lowery 12-102; Bodamer 5-84, 1 TD; Drabert 6-22; Zach Ramadhan 2-5, 1 TD; Camrin Stuckey 1-4; Johnny Sena 1-3; Trey Miller 1-(-4). OE – Pinner 2-25; Kerr 1-10; Knapp 1-4. PA – Charlie Buchanan 3-103, 1 TD; Stuckey 3-73, 2 TD; Tyce Miller 2-34; Ramadhan 1-9; Nick Conway 1-6.